The single biggest problem in most mapping software is the ability to draw more than one ring around a waypoint. In ballooning competition we obviously need to see both the minimum and maximum distances and in the case of 3D tasks, often more. 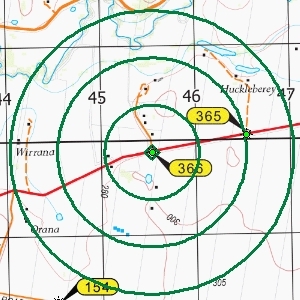 The task rings tool was the first part of the ozitarget tool set because this feature alone can make flight planning on a computer a viable option. When the tool opens it will be showing "Task 1" at the top. This is a drop down menu to select one of the eight sets of tasks. The four boxes underneath this are for entering the radius of the rings. It does not matter which boxes you use or the order that you enter the radius. To draw an arc first click the arc button that looks like this : then click on the map in the direction that you want the arcs to be drawn. To clear the rings you have drawn use the button. To open the numeric keypad use the button. The change the units for the ring/arc radius open the numeric keypad and select the units you require. Note, the data in the radius boxes will not be converted and you will need to redraw your rings for the changes to take effect. 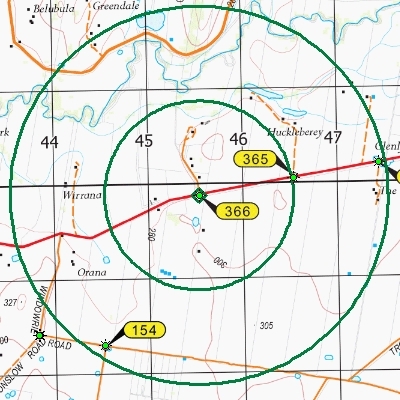 If you change any of the radius data you will need to redraw the rings/arcs to update the drawing. It will not be done automatically. You don't need to reselect the waypoint each time. If the waypoint info is correct simply redraw the rings/arcs after any changes. If you move the waypoint you will need to reselect it to update the position information before redrawing. More settings are available in the oziTarget settings window including the angle the arc covers (default is 120º) and the scale of the marker. What is the marker for? The marker allows for a quick visual check as to which waypoint is actually the center of the ring or arc. When the radius is large or there are a number of goals close together the marker just gives you a quick visual clue as the which waypoint you are working with. 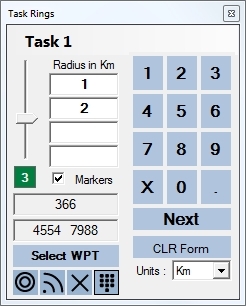 The scale of the marker can be changed in the main settings for oziTarget using the "Task Rings ID size (m)". This is the radius of the diamond that is drawn around the waypoint. Probably the most asked for feature is to be able to move a "Cake" or "Donut" type set of rings around the map. It is a few more clicks than we would like but it is still faster than most software where you are moving two or three waypoints on top of each other to reposition a 3D task.